A lot of people try to follow some variation of “buy low and sell high” when structuring their assets. It is a very ephemeral strategy, because you spend your life switching from bond to bond, stock to stock, renting stocks the way a gentleman rents a beer on a Saturday. It’s all so…short term in nature. It is a strategy that is constantly chasing the greener grass on the other side. There is another way to structure life. Find the strongest companies in the world, find the companies that grow profits almost every year without fail, and reward shareholders with more and more profits each year in the form of cash dividends. When we are talking drinks, that means Coca-Cola. When we are talking snacks as well, that means Pepsi. When we are talking energy, that means Exxon and Chevron. When we are talking dish soap and toothpaste, that means Colgate-Palmolive. When we are talking cereal, that means General Mills. When we are talking conglomerates that do everything, that means Johnson & Johnson and Procter & Gamble. Those are the no-brainer stocks that should be the backbone of your portfolio. Those are the kinds of companies that are going to keep chugging out cash for you to deploy the rest of your life, and God willing, allow you to pass on to your heirs when your journey on this side comes to an end. Coca-Cola has 500 brands. Procter & Gamble has a product in 398 out of 400 American homes. Johnson & Johnson has increased cash flow per share in 48 out of the last 50 years. Exxon and Chevron generate the kinds of profits that make them the size of several small countries. Colgate-Palmolive has been paying out dividends since Grover Cleveland was President of the United States. 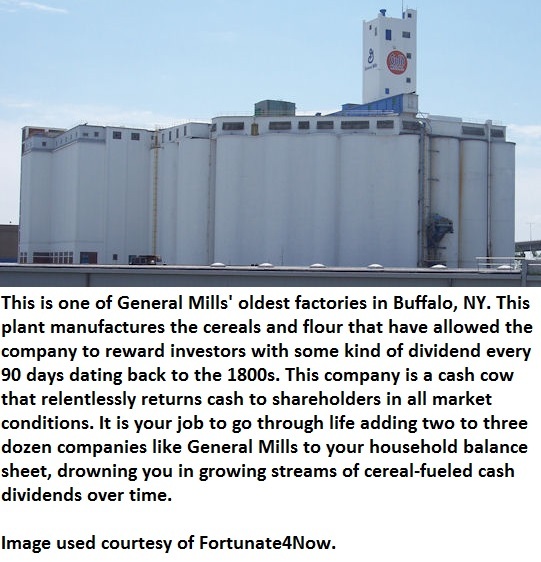 General Mills has not missed a dividend payment in the past hundred years, despite a Great Depression, two World Wars, and technological change that would make the heads of our grandparents spin. The Warren Buffett I mentioned above reminds us that some companies move from strength to strength. They grow profits almost every year. The dividend constantly goes up. They are perfect businesses that encourage you to think like a long-term business owner. As you grow older, these companies will give you more and more money. Get them on your household’s balance sheet sooner rather than later. Turn your personal finances into a financial fortress. Find the most dominant companies in the world (outside of the tech and financial sectors) and become a part owner. Imagine having 1,000 shares of Chevron under your belt by the time you are fifty years old. Right now, that would give you $4,000 in annual dividends. Just for waking up in the morning, you’d be making $11 every twenty-four hours that you stay alive. And it all passive. That is the best part. Buffett’s recommendation that we focus on quality and hold for the long-term changed everything. Wealth-building is about style as much as it is about substance. My goal is not to die with the highest net worth. I don’t want to be like a frog, jumping from lily pad to lily pad always in pursuit of something better. I want to find excellent companies likely to be around and profitable in thirty years, and then establish ownership stakes in them. When new investment capital becomes available, I’ll find another company that meets those characteristics. That is the “wash, rinse, repeat” cycle I want you to repeat throughout your own life.